With winter storm warnings in place for large swathes of the Northeast, including major metro hubs of Philadelphia, New York City and Boston, the onset of heavy snow is all but a certainty. But as insurers and reinsurers will tell you, the term ‘winter storm’ covers a multitude of hazards, such as high winds, snow, severe cold, and freezing rain, all of which can cause significant property damage and ultimately insured losses. 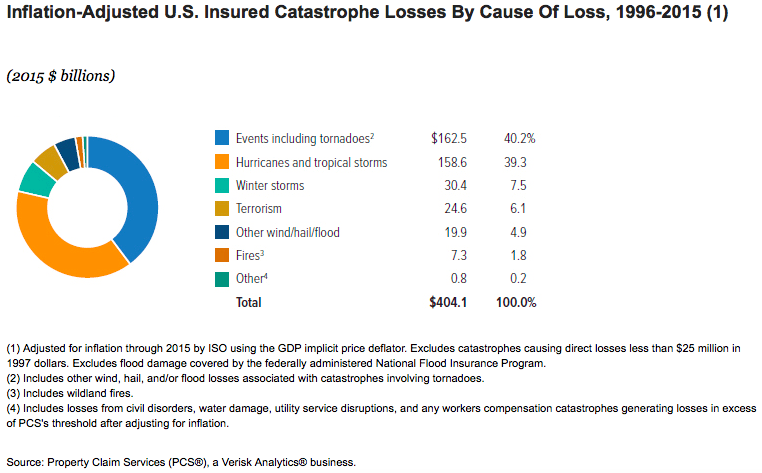 Insurance Information Institute facts and statistics show that from 1996 to 2015 winter storms resulted in about $30.4 billion in insured catastrophe losses (in 2015 dollars), or about $1.5 billion a year on average, according to Property Claim Services (PCS). Given the broad definition and impacts of winter storms, how we prepare for them and prevent loss has to expand too. Check out this FEMA resource on what actions to take when you receive a winter weather storm alert from the National Weather Service for your local area, and what to do before, during and after a snowstorm and severe cold. And here’s a handy last minute winter weather checklist from the Insurance Institute for Business & Home Safety to help homeowners and businesses prepare for power outages, prevent frozen pipes and roof collapses due to snow.